Elevated blood cholesterol is a common reason why people see their doctor. Most of us have been told that high cholesterol increases the risk of cardiovascular disease, and we are usually urged to lower it by any means available. But, the problem is that high cholesterol is often harmless, and heart disease can occur in the absence of high blood cholesterol. 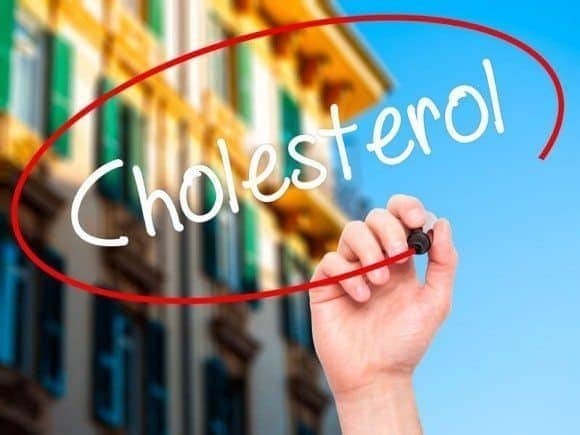 However, there is a genetic disorder called familial hypercholesterolemia (FH) that is associated with high blood cholesterol and increased risk of suffering from coronary artery disease (CAD) early in life. Severe hypercholesterolemia is defined as having an LDL cholesterol (LDL-C) >190 mg/dL (4.9 mmol/L). FH is one of the underlying causes of severe hypercholesterolemia. FH is an autosomal dominant, genetic disorder where the clearance of LDL particles by liver cells is impaired, leading to high blood levels of LDL-C. The liver is the gatekeeper for LDL and is responsible for its clearance. Liver cells express LDL-receptors on their surface, that bind LDL and remove it from the blood stream. FH results from defects in the hepatic uptake and degradation of LDL via the LDL-receptor pathway. It is often assumed that people with LDL-C >190 mg/dL (4.9 mmol/L) have FH and should, therefore, be treated aggressively with cholesterol-lowering drugs. But this is incorrect because most individulas with severe hypercholesterolemia don’t have FH. So, what is the real prevalence of genetic mutations causing FH among patients with severe hypercholesterolemia? This is an important question because people with severe hypercholesterolemia do not necessarily have FH and are therefore at a relatively low risk of CAD compared to those with FH. The issue was addressed recently in a very important paper by Amit V. Khera (Massachusetts General Hospital, Harvard Medical School, Boston, Massachusetts andBroad Institute, Cambridge, Massachusetts) and coworkers published in the Journal of the American College of Cardiology (JACC) (1). The objectives of Khera’s paper were twofold. The first was to assess the prevalence of FH mutations among people with severe hypercholesterolemia defined as LDL-C >190 mg/dL (4.9 mmol/L). The second was to address the question whether those with a gene mutation are at higher risk of CAD than those without the mutation, despite similar levels of LDL-C.
Three genes causative for FH were sequenced in 26.025 participants from seven previously described case-control studies and 11.908 patients from five prospective cohort studies. Some of these individuals had documented CAD and some had not. A control group with low LDL-C (< 130 mg/dL (3.4 mmol/L)) was also defined. Among approximately 40 thousand participants free from coronary artery disease, 6.7% had severe hypercholesterolemia defined as LDL-C > 190 mg/dL (4.9 mmol/L). Only 1.7% of those with documented severe hypercholesterolemia carried an FH mutation. At any LDL-C level, the risk of CAD was higher among FH mutation carriers than non-carriers. Compared with the reference group with LDL-C < 130 mg/dL (3.4 mmol/L) and no mutation, those with an LDL-C > 190 mg/dL (4.9 mmol/L) and no mutation had a sixfold higher risk of CAD while those with both and LDL-C > 190 mg/dL and an FH mutation had a 22-fold increase risk of CAD. An analysis of participants with serial lipid measurements over many years revealed that FH mutation carriers had higher cumulative exposure to LDL-C as compared with no carriers. This may be described as a more persistent hypercholesterolemia. 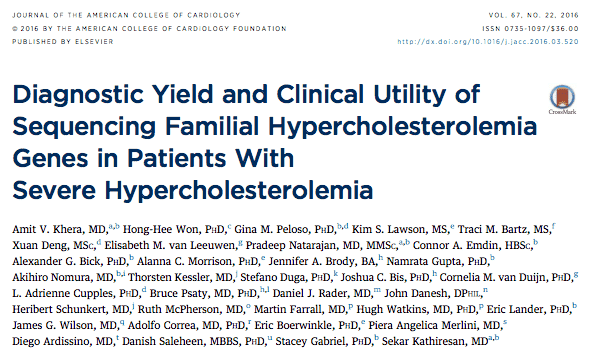 The study confirms that FH, as defined by gene sequencing is a rare disorder, even among patients with severe hypercholesterolemia (< 2%). However, when present, it carries a substantially increased risk of CAD. It is evident that FH mutations explain only a small fraction of severe hypercholesterolemia in the population. So, a remaining question is what explains elevated LDL-C among the majority of people with severe hypercholesterolemia. Two possibilities highlighted by the authors of the paper are polygenic hypercholesterolemia and lifestyle factors, or a combination of these two. Of course, future genetic studies might find additional causal variants, genes not considered in this particular study. The authors believe their data support the hypothesis that an FH mutation present since birth, increases CAD risk via lifelong exposure to LDL-C. By contrast, an elevation of LDL-C in those without a genetic mutation might reflect a time-limited exposure, partly related to lifestyle factors. However, the authors don’t address the possibility that the increased risk of CAD associated with the FH gene mutation may be mediated by other factors than LDL-C.
Interestingly, FH mutations were found at all levels of LDL-cholesterol. Of all the 164 mutation carriers in the study, 44 (27%) had an LDL-C of < 130 mg/dL. Hence, the FH gene mutation may be present in individuals who don’t have hypercholesterolemia. The paper by Khera and coworkers confirms the malignancy of the FH gene mutation. Although the incidence is low, the implications are high. Therefore, genetic testing should be warranted to identify the disorder. But who should have genetic testing? The cholesterol level does not seem to be helpful as the genetic mutation for FH is found in patients with both low and high LDL-C. However, the greatest risk associated with the genetic mutation is present in those who have LDL-C >190 in addition to the mutation. Therefore, genetic testing is probably only appropriate if severe hypercholesterolemia is present. The 2013 ACC/AHA guidelines for primary prevention of cardiovascular disease suggest statin treatment for individuals with severe hypercholesterolemia (LDL-C >190 mg/dL (4.9 mmol/L)) (2). Obviously, those with a combination of severe hypercholesterolemia and the FH gene mutation will benefit most from such therapy. The question is whether statin treatment should be reserved for this group only. If lifelong exposure to cholesterol is a critical issue, and fluctuations in LDL-C among those without the FH gene mutation explain the difference in risk between those with and without the mutation, lifestyle modification may be the most appropriate treatment for 98% of people with severe hypercholesterolemia. The FH gene has nothing to do with familial hypercholesterolemia. In logic, this is called a black swan. Nope. There is a large variety of mutations & consequently not everyone who has such a mutation has hypercholesterolemia. This doesn’t, of course, mean that FH isn’t genetic in origin. This is kind of astounding. My son-in-law died at 34 of LAD total occlusion. My daughter had 3 children all still in diapers. First thing I wanted to do after taking care of them financially, was get the kids checked for FH. I had retired from a hospitla that specialized in coronary disease with interventional treatment andI knew this was the right thing to do, although kind of unusual with kids then. It was 2002. Anyhow, they’ve been tested yearsly and followed by a pediatric cardiologist. With some reading,I told my dauhter thye should really have further testing for FH. She had been told they had FH. But no specific testing for it. The doc laughed it off and said the test I asked for are only done in Europe and are not covered by insurance. So my daughter never had further testing done. I’d still like to see it though. The kids are becoming adults and I would like to tell them what they might do further to test for this genetic mutation. Is there a name to a laboratory test that tests for genetic FH? They’ve been eating high carb, and no saturated fats for so long. I’ve tried to turn them around but they can’t. The oldest is very overweight but loves her carbs. I want the people I leave on this earth as my gift to it to be healthy! Any words of wisdom would be great! Sorry to hear about this family history. Thanks so much for the link. I’ll have a talk with my daughter and my grand kids again about this. I’m thinking the boy (now 18) should be tested for FH as well, even though his lipid panels have been very normal. Ha! The kids call me doctor memaw. Do you happen to know if the “sixfold higher risk” and the “22-wold [sic] increase risk” is calculated using the relative risk ratio? I am guessing that it is and the absolute risk increase is significantly lower. However, as we are comparing two groups, the comparison is always going to be relative. We’re not talking about risk reduction, so relative vs. absolute risk reduction is not an issue here. The calculation is pretty complex. Those with LDL-C 190, and 22.3 for the FH mutation positive with LDLC >190. Indeed, if a hypothetical absolute 5 out of 100 CAD risk for the control group versus an absolute 30 out of 100 risk for the other group, that is patient and life significant. High relevance. But I sense the sixfold higher risk determined by these researchers is more a result of a statistical methodology that is not related to a true absolute risk measurement and comparison, nor necessarily relevant to patients in assessing their true risk. If a regression was involved, I doubt the sixfold increase would hold when looking at the actual absolute numbers. If my doctor recommended a critical treatment due to the ‘odds ratio’, my immediate response is going to be – “based on what?”. I’m pretty sure that conversation would then go downhill in a very quick fashion. Personally, I sometimes think researchers rely too much on statistical gyrations, combined with their obfuscating the actual study numbers, in order to produce eye-popping results that are often indecipherable as to their basis, and maybe even misleading. I agree with you JFord. In my opinion it’s too much statistical acrobatics. The result will often be a message that is hard to understand and that is not really useful for the practicing clinician or the patient. I am a fourth year American medical student trying to sort out my health issues before disappearing into the black hole of residency. I would love your feedback on my sort of odd lipid panel, if you could spare a moment! I am a healthy 28 year old woman. Normal BMI, baseline BP ~100/60, A1C 4.9%. Very active with crossfit and running. I’ve had high cholesterol for life (LDL > 160 since age 11 or so, now at age 28 > 180 – 200). This is consistent with just about everyone in my mom’s side of the family. I saw a pretty old school cardiologist this week who wants me to stop eating all saturated fat and dietary cholesterol and wants me to start on high-dose statins ASAP. This would be a pretty big change for me as I overall eat low carb-ish (not a fanatic about it; eat starchy veggies and desserts occasionally but generally avoid grains and sugar. I could probably stand to cut back on cheese to be honest.) I take fish oil daily but am very hesitant to start on a drug for life. My current thinking is: I will get the genetic testing for FH, and Lp(a) is also pending. If one of those is positive, then I guess I have no choice but to start statins, but perhaps I can try low-dose plus dietary changes. If not, though, does my very high HDL, low triglycerides, and low A1C make me pretty metabolically healthy and give me a pass on my crazy LDL? Thank you so much for your expertise and this fantastically-written blog! I think the difference in LDCL-C here between Friedwald and the Iranian formula is a typical example of how LDL-C may be overestimated when TG’s are low. I would vote for the Iranian formula here. I think you’re spot on with the statin issue. I would not recommend statins here unless it’s proven by genetic analysis that you have FH. It is unlikely in my opinion, just as you said yourself, considering the absence of premature CAD in your family. And, as you’ve pointed out correctly, the high HDL-C and low TG’s is clearly a positive thing. So, to me it appears that you’remetabolically healthy and I don’t think have to avoid healthy natural fats, saturated or not. Wish you all the best with your medical studies and thank you for visiting my blog. Thank you for providing a clear and quick answer! Really enjoying poring through your posts. Fingers crossed the FH panel is all negative. It would really surprise me if it isn’t negative. So good news – all the FH testing (APOB, LDLR, LDLRAP1, PCSK9) was negative! Lp(a) is elevated at 65, though. Considering starting niacin as it sounds like it lowers Lp(a) and has fewer side effects than statins as well as being a potent anti-inflammatory. Are there any downsides to niacin if I can tolerate the flush? Where did you get your FH testing at? I want to get tested for it. Also, I just posted my thoughts on Niacin. Not sure if Dr. Sigurdsson agrees or not. Thanks, David and Dr. Sigurdsson! David – Do you take it in the morning or night time? With food or without? I got my testing from GeneDx – they were great to work with and really quick. They accept insurance and the co-pay is on a sliding scale, so most people are <$100 out of pocket. Has to be ordered by a doc still, though. Thanks for the heads-up about GeneDX. I ALWAYS take Niacin with food. It will flush the heck out of you without food. I usually take a baby aspirin beforehand, and it makes the flush not as bad. All experts recommend starting with 100 mg, and then adding 100 mg more every day or so. Your body will build up to dosage. I did that and now I handle 2,000 mg a day easily. I take it in divided doses – 1,000 mg with breakfast and then 1,000 mg with lunch. So far, no blood sugar OR liver issues. I am a 36 year old male, and my Doctor (great primary care doctor) has been testing my lipids for years. My LDL-C averaged about 150 mg/l, and my total cholesterol about 220. My father got his lipids first tested around my age and his total cholesterol was over 300 and his LDL-C was 250. At 40 years old my father started statins (even Simvastatin 80 mg) and tolerated them well. 22 years later he is still doing well and no symptoms of CAD. With atorvastatin 80 mg his LDL-C is 70 mg/l. In the meantime I consulted a great lipidologist (Dr. Tara Dall) who also tested my lp(a). My lp(a) was very elevated at 220 nmol/L. I was told a normal lp(a) should be under 75 nmol/L, and anything over 125 nmol/L is high. So, I started on fish oil and baby aspirin every day. So, I apologize for the long post, but what do you think? Am I off-course to be taking a statin and niacin + baby aspirin/fish oil or is that warranted due to my high ldl-particles and lp(a)? The million dollar question that keeps bothering me is why did neither my father or I have any CAD if our cholesterol is so bad? I got a heart scan 6 months ago and there was zero coronary calcium. I tolerate both pravastatin and niacin very well, but hate taking any drugs. I have been very impressed with all of your posts, and wanted to get your take on my situation. The second million dollar question I have is do I have familial hypercholestermia or not? If not, why did my cholesterol suddenly shoot up so high about one year ago? And why did my father exhibit a similar cholesterol profile when he was around my age (he was 38 years old)? his LDL-C is 70 mg/l. low-fat diet. I also added cholest-off and other supplements (from Dr.
At this point my Doctor insisted I had to be on Statins and so I agreed. started on fish oil and baby aspirin every day. my high ldl-particles and lp(a)? months ago and there was zero coronary calcium. profile when he was around my age (he was 38 years old when he was first tested)? p.s. – I tried to post this twice and apologize if it comes through again. After re-reading your article I have another quick follow-up question/comment. If someone is identified as having high lp(a) and high ldl-c (and ldl-p) then should they always be treated with statins? From what I have gathered in speaking with various doctors the answer seems to be yes. However, is it worth is to check for FH gene? I asked my lipidologist and she said she used to test for FH gene, but the test is very expensive (over $ 1,000) and does not change how she would treat severe hypercholestermia. Also, for the past year I have been doing my own research and it appears that the risk of high lp(a) is attenuated if ldl-c is lowered below 100 mg/l. I truly find these topics fascinating so appreciate you (and all other readers) weighing in. There is so much we have yet to discover! Thanks for blogging about this. There are several important issues here. Obviously, I don’t have all the answers for you. I think FH is unlikely in your case because of the absence of premature coronary artery disease in your family. Another thing; a coronary calciums core of zero is associated with a very low risk. However, it has to be taken into consideration hat you are very young. We don’t know what your score will be 10 years from now. I agree that your Lp(a) is a concern. Niacin and the new PCSK9 inhibitors are able to lower Lp(a) but we don’t have any studies as of yet showing that lowering Lp(a) by drugs is beneficial. Of course it might. We just don’t know for sure. As you seem to be tolerating statins+niacin very well, the easiest decision would be to advise you to continue on this treatment. Another option would be to take you off treatment and have a new calcium score in 5-7 years. Such a decision may in your case be supported by a calcium score of zero. Thank you very much for the wonderful and comprehensive reply! I very much appreciate it. I have decided for the sake of my children to take a genetic test to determine whether I have FH or not. That said, what genetic tests do you recommend and where? I live in the United States. profile when he was around my age (he was 38 years old)? I loved Dr. Sigurdsson’s article on Niacin! I have found that I can tolerate regular “flush” niacin really well. However, some people can’t. The only advise I have is IF you take Niacin make sure to check your liver enzymes and blood sugar as it can elevate both. I recommend “Cholesterol Control Without Diet! : The Niacin Solution” by Dr. William Parsons if you want to learn about Niacin, and how to use it. Dr. Parsons repeatedly emphasizes that Niacin at cholesterol-lowering doses requires medical supervision. I wish you success as I too have elevated Lp(a)! However, my lipidologist (Dr. Tara Dall) emphasizes that taking Niacin to lower Lp(a) has not been proven to be effective through any clinical trials. In fact, the only thing proven is that if you lower your LDL-C and LDL-P low enough that somehow negates the effect of elevated Lp(a). So, for me I take pravastatin and niacin to drive my LDL-P low. Did you get your LDL-P tested? You might already have a low LDL-P? I also take a baby aspirin and fish oil to thin the blood and counter lp(a) pro-clotting. Thanks for this reply! I will give my PCP a heads up that I’m taking niacin… I think my cardiologist is not interested in seeing me any more given the negative FH testing and that I’m not interested in a statin right now (or in cutting out all dietary fat and cholesterol – he is pretty old school.) What monitoring does your lipidologist recommend? I haven’t had the exact particle size of my lipids measured, but my low triglycerides (usually around 45-55) make me suspect the LDL would be on the bigger, fluffier side. My lipidologist recommends that IF you have elevated lp(a) your ldl-particles should be less than 1,000. Ideally, between 700 to 1,000. OK, I forgot to write this yesterday, but you may want to consider fat reduction. Some people are hyper-responders to saturated fat and cholesterol. They more they eat the more they absorb. Some are not, but you might be. Total Cholesterol of 290 and LDL-C of 188 is no joke! There are numerous articles on the internet about this. If you want I can try go dig them up. Last, particle size is nonsense. It is ALL about particle number. Familial hypercholestermia people ALL have large, fluffy particles and they die because they have a lot of them. Thanks for pointing me to the saturated fat/cholesterol hyper-responders situation. I definitely think that could be me. The good news is, I eat a lot of saturated fat now, so I can probably cut my intake quite a bit and see what difference that makes. I wonder if I have Familial Hypercholesterolemia (FH) and would love to hear your feedback. I am a 70 year old woman and have high cholesterol (total cholesterol >270) since the age of 40. I was put on a statin since age 45 and TC stayed in the range of 190 to 215. I stopped the statin 2 years ago. I never had MI / stroke events. My family members did not have MI / stroke events. As I have high LDL of 205, do you think I have Familial Hypercholesterolemia (FH) ? I’d love to hear your feedback. Thank you lots and this excellent blog, Dr Sigurdsson. Only genetic testing can give you the answer. However, the absence of premature coronary artery disease in your family would in my opinion suggest that you don’t have FH. Thank you lots and lots for your feedback Dr Sigurdsson. I don’t have xanthelasma nor arcus cornealis. I have been taking statins for 15 years from age 53 to 68 and my LDL remained at 115 and HDL at 66 for these 15 years. Perhaps these 15 years have reduced my long term accumulative LDL burden. I stopped the statin 2 years ago. Now at age 70 with a Calcium Score = 141, LDL = 200, HDL = 73, Would it be necessary to take Statin again to lower risk? Is it true that Statin is not effective for old people? Is a Calcium Score = 141 normal or dangerous for a 70 year old woman ? Although Calcium Score = 101 to 399 represents intermediate risk, but since I am old and my CAC = 141 is only slightly higher than 100, could I be classified as low risk in the Calcium Score category? Can you feedback please? I have substantially reduced the number of questions. I have been taking statins for 15 years from age 53 to 68 and my LDL remained at 115 and HDL at 66 for these 15 years. Perhaps these 15 years have reduced my long term accumulative LDL burden. I stopped the statin 2 years ago. Now at age 70 with a Calcium Score = 141, LDL = 200, HDL = 73, Would it be necessary to take Statin again to lower risk? Is it true that Statin is not as effective for old woman like me? Do you think lipids (LDL, non-HDL, Total Cholesterol / HDL ratio) is a weak risk factor? I would like to ask you just one question please. You are a smart doctor and probably the only one who is conservative on statins. I really would love to hear your feedback which would give me peace of mind. Would you kindly feedback please? I have been taking statins for 15 years from age 53 to 68 and my LDL remained at 115 and HDL at 66 for these 15 years. Perhaps these 15 years have reduced my long term accumulative LDL burden. I stopped the statin 2 years ago. Now at age 70 with a Calcium Score = 141, LDL = 200, HDL = 73, Would it be necessary to take Statin again to lower risk? I have to remind you that my blog is for general informational purposes only and does not constitute the practice of medicine, including the giving of medical advice, and no doctor/patient relationship is formed. The content of this blog is not intended to be a substitute for professional medical advice, diagnosis, or treatment. That said, I can tell you that I agree with you that 15 years of statin treatment has surely reduced your accumulative LDL-C burden. In your case, taking a statin drug is not a necessity but rather a choice. The absence of cardiovascular disease among your closest relatives surely is a good sign. I do have many patients with similar number as yours that seem to do great without statins. Healthy lifestyle is a key issue here in my opinion. If you choose to take a statin drug (like many of my patients do, after I’ve informed them about pros and cons), I would definitely not try to make you change your mind though. Like so often in medicine there is no right or wrong here. Thank you lots and lots for your feedback. I understand that no doctor/patient relationship is formed here and everything you said. From reading your blog, you have a great heart to help people. That’s why I really look up to you and wish for your opinion. I have been eating healthy and exercising all the time. The issue regarding whether or not to take statins is always on my mind. Can you give me your opinion please whether or not it is a good choice to take statin to lower risk? I am not sure if the benefits of statin would outweight the risk of the statin side effects such as diabetes and liver problems etc. Can you answer this please? I have input my data into different risk calculators and the 10 year risk varied from 4% to 9% and also the risk go up dramatically with age so it doesn’t seemed to be very reliable. Is my risk low? My Calcium Score = 141, LDL =200, HDL =73, blood pressure is good and no diabetes. In your opinion, will you recommend statin treatment? I am really flattered for your opinion. I have seen 2 cardiologists before and I will make up my mind considering their opinions too. I’d really love to hear your feedback. Thank you lots and lots, Dr Sigurdsson. I’d like to ask you a scientific question , would you be able to feedback please? For a 70 year old woman with high cholesterol (LDL = 200, HDL = 73) as the only risk, If her Calcium Score (CAC) = 0 , then I think the risks of taking a statin outweights the benefits so it is better not to take the statin. However if her CAC > 400, then I think the benefit of taking a statin outweights the risks so it is better to take the statin. The difficult question is what if the Calcium Score is around 150 to 300. Assuming her CAC = 150, LDL = 200, HDL = 73, Does the risks of taking a statin outweights the benefits? May I have your opinion please? I would be really flattered for your feedback. Thank you lots and lots Dr. Sigurdsson.